The Great Wall of China is one of the greatest sights in the world. Most tourists see the majestic Great Wall by day. Can you imagine, however, what is it like to catch the night views of the Great Wall? Stay overnight in a beautiful water town at the Simatai section of the Great Wall. Try out a Chinese cultural experience. Appreciate the stunning views of the Great Wall by night. 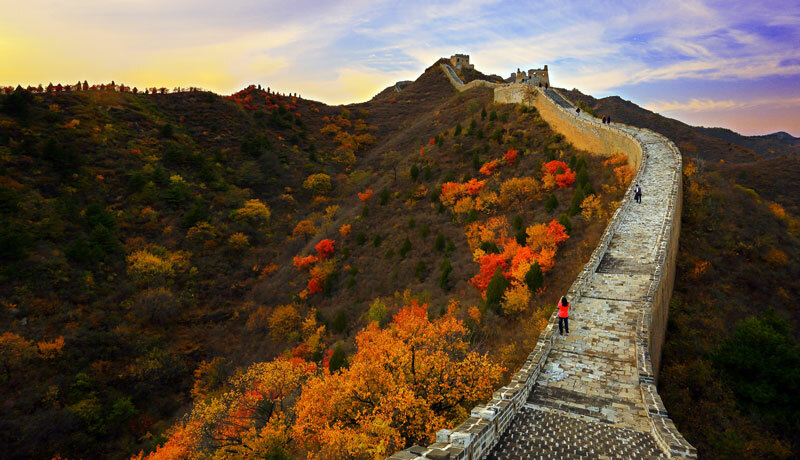 This 4-day Beijing tour combines the city highlights and a Great Wall night tour to give you a special experience during your stay in Beijing. Get to know what the ancient Chinese emperors&apos; lives were like in the Forbidden City. Enjoy the spectacular and original appearance of the Great Wall. See the Simatai wall lit up all along the ridge of the mountains at night. Try out a handpicked cultural experience (tie-dyeing, kite making, or Buddhist text tracing). Take pictures of the most authentic Chinese places in Gubei Water Town. It was an amazing tour, the best one yet. I had taken 3 overall and I remember Johnny for making that special tour on the Jinshanling section of the great wall, Gubei water town, and Simitai night viewing section of great wall memorable. Your private guide will be ready to meet and greet you at the arrival hall of the airport or at the train station&apos;s exit. A comfortable private car (non-smoking) with an experienced driver will transfer you directly to your hotel where your guide will help you to check-in. If your arrival is in the morning, it is no problem to arrange some sightseeing for you in the afternoon if you wish. After breakfast, a comfortable private car will transfer you and your guide to the historic Tian&apos;anmen Square. You will have some time there for taking photos after your guide has provided you with some commentary about the history and architecture as well as anecdotes about the square. Then enjoy the highlight of the day – the Forbidden City – which was home to 24 emperors in the Ming and Qing dynasties from 1420 to 1912. In addition to giving you a background introduction on the Forbidden City&apos;s architecture, history, and art, your guide will take you to 12 selected places in the complex to discover the deep secrets of the royal families, while other group tours only visit six spots briefly. When Queen Victoria ruled the British Empire, Empress Dowager Cixi reigned China. You can learn about her rise from being a concubine to leading China in the Forbidden City from your guide in Beijing. Listen to the stories about eight famous royal figures in the two dynasties. Your guide will present a "living" Forbidden City to you. Have a rest and enjoy a delicious lunch at our selected local restaurant. Your guide will help you order the dishes you like. After lunch, your guide and driver will take you to the Temple of Heaven — a place where emperors used to pray for a good harvest. The Circular Mound Altar, Echo Wall, and the Imperial Vault of Heaven are rated as key sights there, and you will see them all. 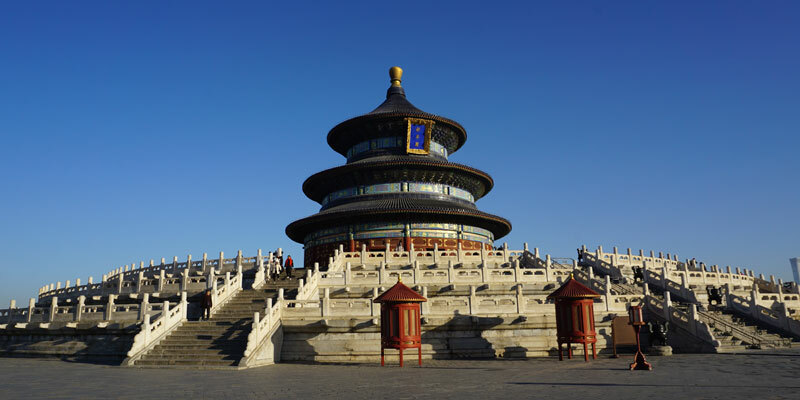 It is possible to replace the Temple of Heaven with any other site that you are more interested in, such as the Summer Palace or a hutong tour in a rickshaw. After breakfast, travel to Gubei Water Town. It takes about 2½ hours to get from central Beijing to Gubei Water Town, where you will stay overnight. Your guide will help you with the hotel check-in after you arrive then he/she will go with you to the Simatai section of the Great Wall to begin your tour. The best way to enjoy sightseeing at Simatai is to take the cable car up and walk back down slowly around the lakeside. 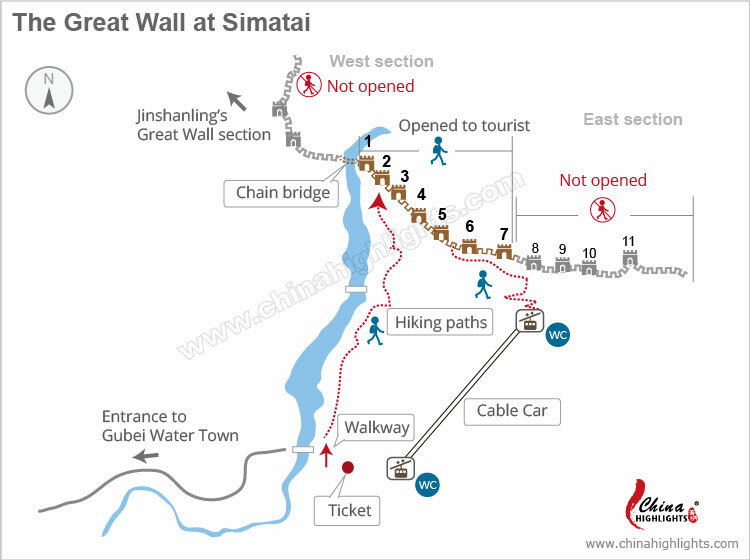 This allows you to see the route from a different perspective each way and the climb up to the Simatai section of the Great Wall is a challenging one — it is much steeper than the Badaling and Mutianyu sections. Take a rest and have dinner. You can eat at a restaurant from where you can clearly see the lit-up wall while enjoying your delicious meal. At about 8 pm, your guide will accompany you to take the cable car up to the wall and see the stunning night views. Simatai is the only section of the wall which is lit up and open to tourists at night. Only towers 5 and 6 are open to tourists for the night tour, as these two towers are comparatively flat. The trip will last about 1 hour. 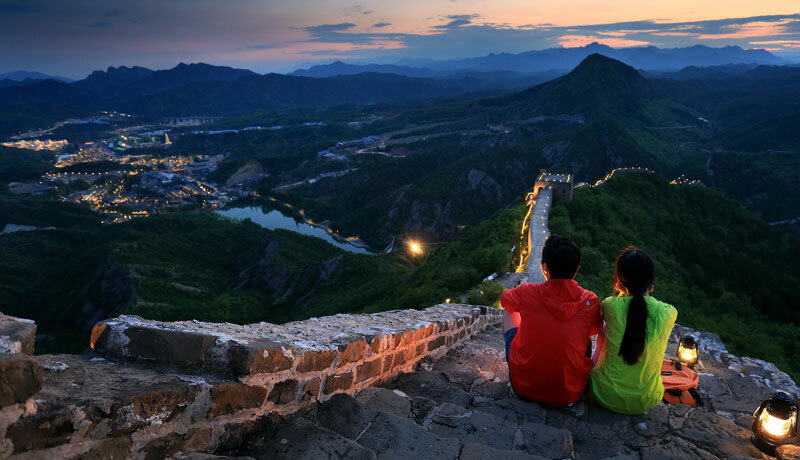 Enjoy stunning views of Simatai Great Wall lit by lights on tranquil nights. Enjoy your time at Gubei Water Town, which is in a traditional courtyard style. If you are an early bird, it is nice to walk around the water town when there are fewer people in the morning. Your guide will be happy to show you some selected places in Gubei Water Town that highlight the authentic Chinese style. Take the most pictures there, if you&apos;d like to. Note: Some of the selected places are high up and you may need to climb some steps (30 to 200 steps) to get there. Afterward, we can arrange for you to have a "one out of three" experience in Gubei Water Town (lasting for about 45 minutes): tie-dyeing, kite making, or Buddhist text tracing. Try one of these Chinese cultural experiences to make your own unique souvenir. The tour will end after lunch and it is better to choose a flight that departs after 5 pm as it will take about 2 hours to get to Beijing Capital International Airport. Your guide will handle your luggage and transfer, and will accompany you to the correct check-in desk at the airport or to the train station for your departure. This tour is very flexible. You can alter the itinerary, extending or shortening it to suit your price, interests, and schedule. You can extend it with an extra day in downtown Beijing and visit more attractions. If your time is limited, shorten the tour by one day. We have arranged one night&apos;s stay in Gubei Water Town so that you can appreciate the stunning night views of the Great Wall. Since all the hotels in Gubei Water Town have different room rates for weekends and weekdays, and also for different seasons, the prices may vary according to the season and dates you decide to travel. Gubei Water Town and the Great Wall at Simatai are popular attractions for local people at weekends and during public holidays. To have a better experience, we suggest avoiding the weekends during the summer holiday (July and August) as well as China&apos;s public holidays. Your travel advisor will give the best suggestion according to your schedule. Send us an inquiry using the form on the right. Your personal travel advisor will give you the best options according to your needs.